Evgeny, who lives near the munitions depot, was one of the first to witness the inferno. He told RT that the incident has been downplayed by the Ukrainian media. Explosions are still occurring at the munitions depot, Evgeny said, adding that the entire city of Balakleya has been evacuated. The civil defense department of the city's district administration earlier told RIA Novosti that most of the population of Balakleya had been evacuated. “The first wave of the evacuation has come to an end. Most of the population have been evacuated by buses. Now the buses are returning to evacuate the rest. Specialists are going from house to house checking who remains,” the district administration said. There have been no immediate reports of any civilian casualty. More than 16,000 people have been evacuated from the city of Balakleya, home to 29,000 people, the Ukrainian Emergency Ministry reported. Over 3,500 people were also evacuated from nearby villages. A seven-kilometer (4.3-mile) safety zone has been set up around the burning depot, RIA Novosti reports, citing a Ukrainian military prosecutor. 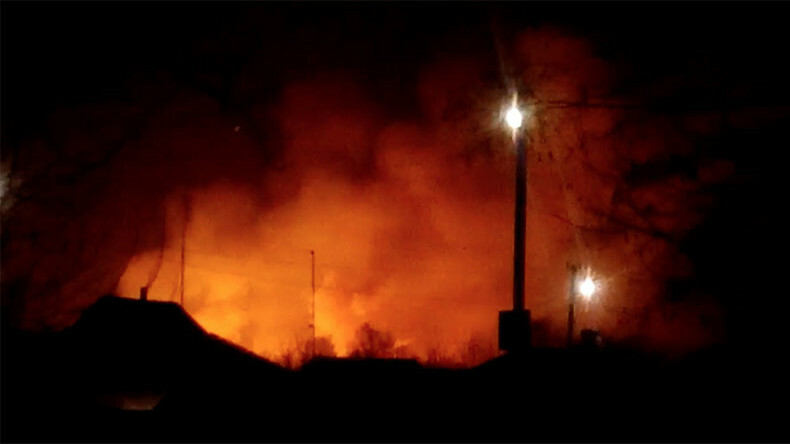 Anatoly Matios, the chief military prosecutor of Ukraine, wrote on Facebook that according to preliminary data, the explosion and fire were caused by sabotage at 3am local time at several storage sites for rocket and artillery weapons (including 125mm and 152mm tank and artillery shells). Matios said the incident was the direct result of sabotage. Nearly 140,000 tons of ammunition are stored at the depot in Balakleya, the chief military prosecutor of Ukraine said on Thursday. “The total area of the arsenal is 368 hectares, with 138,000 tons of ammunition… An unmanned aerial vehicle (UAV) is getting ready for takeoff to establish the actual extent of the arsenal affected by the explosions,” Matios wrote on Facebook. Ukraine’s border service has stepped up control measures in the country’s southeast due to the incident. “The state border service has tightened the border control regime in the east-south direction,” Matios wrote on Facebook. As residents hastily flee the area, RIA Novosti Ukraine reports that mobile networks in the city are overloaded or offline. — Жизнь в Резервации (@CleanAuthoritie) 23 марта 2017 г.